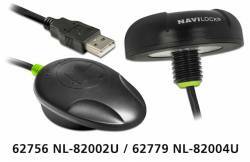 Navilock’s GNSS receivers. Photo source: Navilock. Thalwil, Switzerland-based u-blox’s Untethered 3D Dead Reckoning GNSS module NEO-M8U is at the core of Navilock’s new GNSS receiver series for service vehicles. The new portfolio will enable retrofitting of Dead Reckoning (DR) and Untethered Dead Reckoning (UDR) technology in any vehicle. Combining multi-GNSS (GPS, GLONASS, BeiDou, Galileo) with an onboard 3D gyro/accelerometer, the UDR technology is designed to improve position accuracy even where GNSS signals are weak or even not available, such as in urban canyons, tunnels, or parking garages. Receivers with a serial MD6 interface can work in an extended voltage range from 5-48 Volt DC. Applications for Navilock’s new GNSS receiver series include service vehicles from the police, fire departments, emergency physicians, disaster rescue teams, and technical aid organizations that require accurate positioning at all times. Operational forces and their control centers must be constantly aware of their location to enable successful completion of any assignment. Thus, physical dangers and even life threats are clearly minimized. The u-blox NEO-M8U was launched in 2016 and enables reliable positioning even in case of GNSS signal interruptions, jamming, reflected or weak signals, and is independent of any connection to the car, other than power. The eight new Navilock GNSS receivers will be available in the first quarter of 2017.